Constructed about 1850 by Don Salvador Vallejo. This adobe adjoined his first Sonoma dwelling built in 1836. 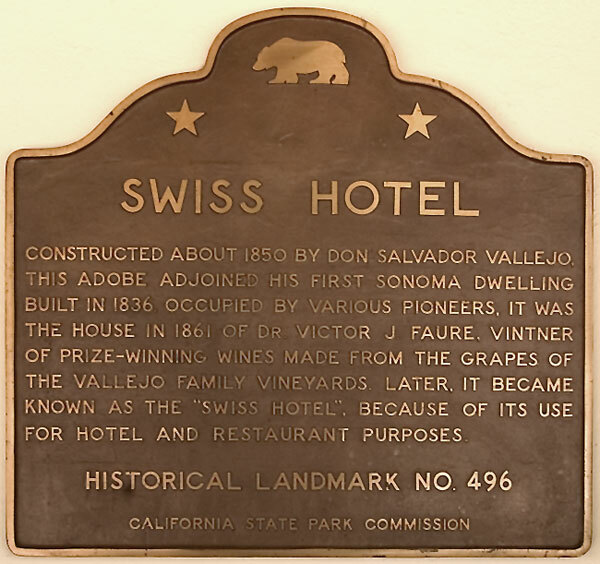 Occupied by various pioneers, it was the house in 1861 of Dr. Victor J. Faure, vintner of prize-winning wines made from the grapes of the Vallejo family vineyards. Later, it became known as the "Swiss Hotel" because of its use for hotel and restaurant purposes. The Swiss Hotel contributes to the Sonama Plaza Historic District National Register Listing #75000489.